5517 - Guardian Dual Check Hydrant and Stainless Steel Box - Jay R. Smith MFG Co. Provides positive non-freeze protection where water is required at the outside of the building and features an integral vacuum breaker and dual check valve. The stainless steel recessed box conceals the nozzle and operating mechanism. The locking cover prevents unauthorized use. The Guardian Dual Check hydrant, with the box, is the go-to choice for contractors working on brick façade buildings. This ergonomic hydrant is designed to fit into the space of one standard brick for easy installation. That adds up to significant time savings because you eliminate extra cuts and mortar repair. 3/4" inlet and hose connection. Removable "T" handle key or ergonomically designed wheel handle. Flush installation to eliminate catch points. Bronze hydrant with stainless steel face. 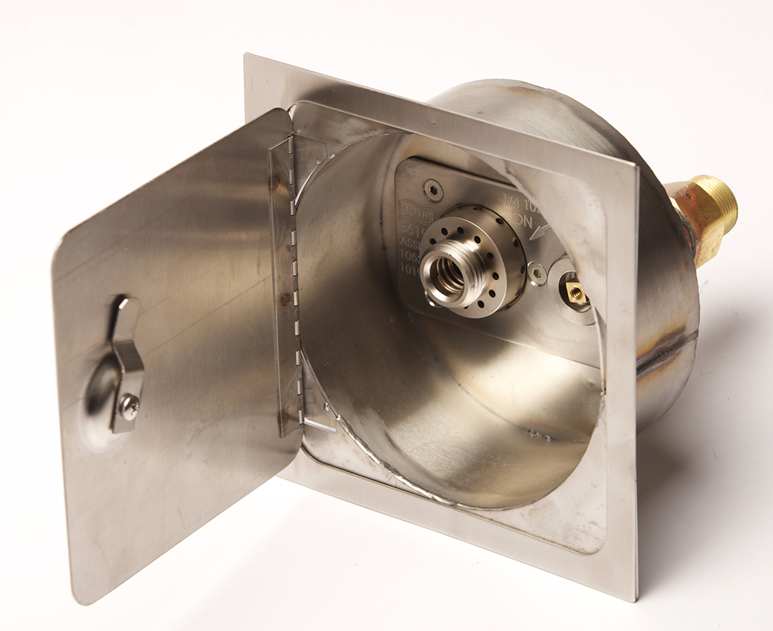 Drop down locking hinged cover opens 180º to allow access without damaging cover. Self draining non-freeze hydrant with dual check valve & integral vacuum breaker. Bronze Quarter Turn Non-Freeze Automatic Draining Hydrant with Stainless Steel Face, Hose Connection, Integral Vacuum Breaker and Dual Check Valve, "T" Handle Key, Wheel Handle and Stainless Steel Box with Full 180° Cover Opening.